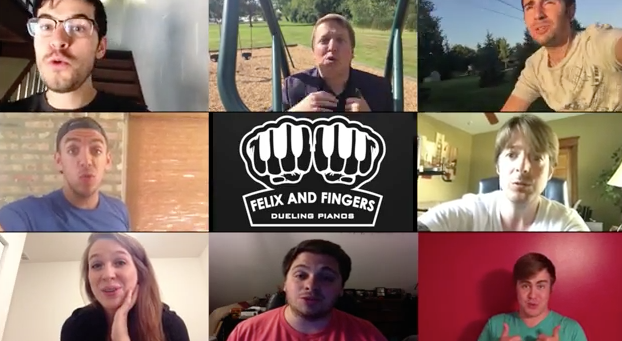 Felix & Fingers Video Blog! After years of endless begging by our supporters, Felix and Fingers has finally put together a video blog! You’ve seen us singing, playing the piano and putting on a show before. Now, you can really see inside the life of a Felix and Fingers Dueling Piano player and find out what we do with our lives when we’re not rocking at a show! Make Suggestions for the Video Blog! Below each video blog is a comments section, where you can suggest a challenge for us, ask a question, or anything you want! We love getting to know people and the quickest way to do that (outside of you know, playing a show) is to read your comments on the internet and respond with a video blog about it. We kicked things off with a 14-song mashup, but as you can see, it doesn’t necessarily need to be musical. We each have other strange skills/afflictions that we are just dying to use to embarrass ourselves. While away on a gig in Amarillo, Texas, Robert and Duncan infiltrated the guitar center guitar room and created a country-fied mashup of a couple popular tunes. Not to be outdone, the Felix and Fingers pets also really wanted to be featured, so we created a video of them dancing to the timeless classic, “Watch Me” by Silentó. After noticing from that video that I have a cat named after a Chicago Bulls icon, we decided to figure out if cat Stacey King plays basketball. Spoiler alert: he doesn’t. Why Are We Doing This To Ourselves? !